b) Jobs to update links for a set of pages (the job title is ignored). These jobs have (pages:(<page id>="">:(<namespace>,<title>),...) set. c) Jobs to update links for a single page (the job title) These jobs need no extra fields set. Definition at line 39 of file RefreshLinksJob.php. Definition at line 47 of file RefreshLinksJob.php. The resulting map conveys everything that makes the job unique. This is only checked if ignoreDuplicates() returns true, meaning that duplicate jobs are supposed to be ignored. Definition at line 309 of file RefreshLinksJob.php. Definition at line 78 of file RefreshLinksJob.php. References $job, Job\$params, and Job\$title. Definition at line 66 of file RefreshLinksJob.php. 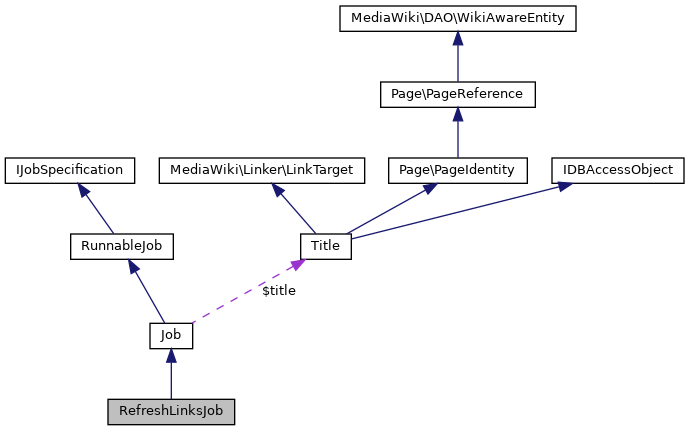 Referenced by LinksUpdate\queueRecursiveJobs(), and WikiPage\triggerOpportunisticLinksUpdate(). Definition at line 85 of file RefreshLinksJob.php. References Job\$title, $wgUpdateRowsPerJob, as, Job\getRootJobParams(), list, Title\makeTitleSafe(), BacklinkJobUtils\partitionBacklinkJob(), runForTitle(), Job\setLastError(), JobQueueGroup\singleton(), and title. Definition at line 142 of file RefreshLinksJob.php. References $options, $services, LinksUpdate\acquirePageLock(), DB_MASTER, WikiPage\factory(), Title\GAID_FOR_UPDATE, Title\getLatestRevID(), InfoAction\invalidateCache(), User\newFromId(), User\newFromName(), null, Job\setLastError(), and wfTimestamp(). Definition at line 325 of file RefreshLinksJob.php.